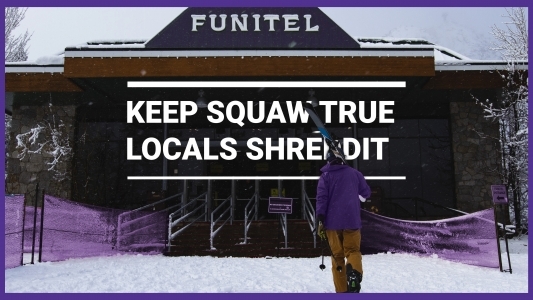 The newly released Keep Squaw True Locals Shreddit will be playing along with The Movie to Keep Squaw True this Thursday, April 4th, at Patagonia Outlet Reno! Check out the trailer below and then RSVP to this free event! Sierra Watch presents The Movie to Keep Squaw True and Keep Squaw True Locals Shreddit at Patagonia Outlet Reno. We will be kicking off this showing with the newly released Keep Squaw True Locals Shreddit, then our feature movie, followed by a Q&A with Dr. Robb Gaffney and Sierra Watch Executive Director, Tom Mooers. Pizza from Sizzle Pie and beers from Revision Brewery and Reno’s IMBĪB Custom Brews will be available with suggested donations going to Sierra Watch. Doors open at 7:00 p.m., show starts at 7:30 p.m.